Home / Blog / How to get Ba Vang temple from Halong? Have you ever heard Ba Vang temple? How about Halong? 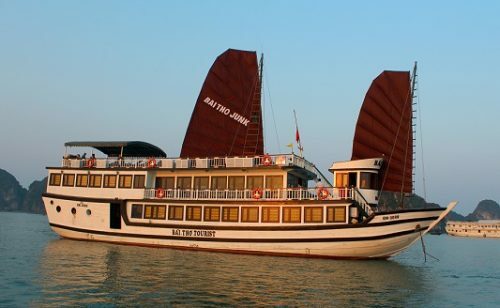 Most of us know Halong Bay because Halong is so famous and it was recognized as the world natural heritage in 1994. Halong is in Quang Ninh province. In fact, Quang Ninh has many attractive places for you to travel. 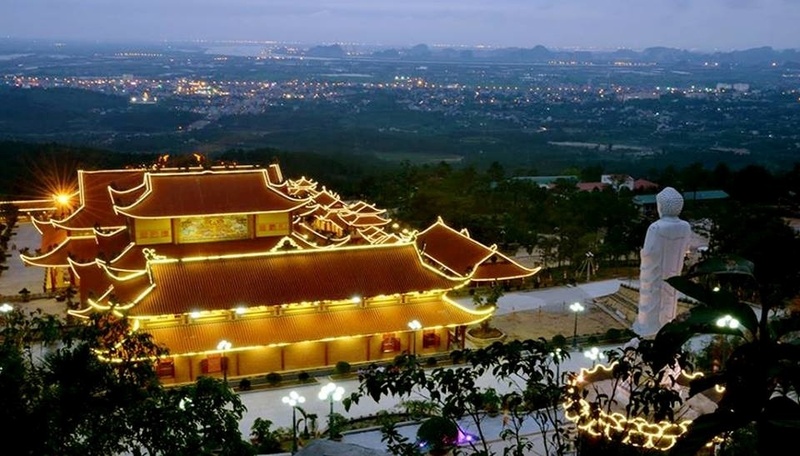 Ba Vang temple is one of famous destinations in Quang Ninh. Today, I would like to spend time on travelling Ba Vang temple. So how to get Ba Vang temple from Halong? I would like to share some my experiences to you and I hope that you can get it as a pocket travel tip when you travel to Ba Vang temple from Halong. 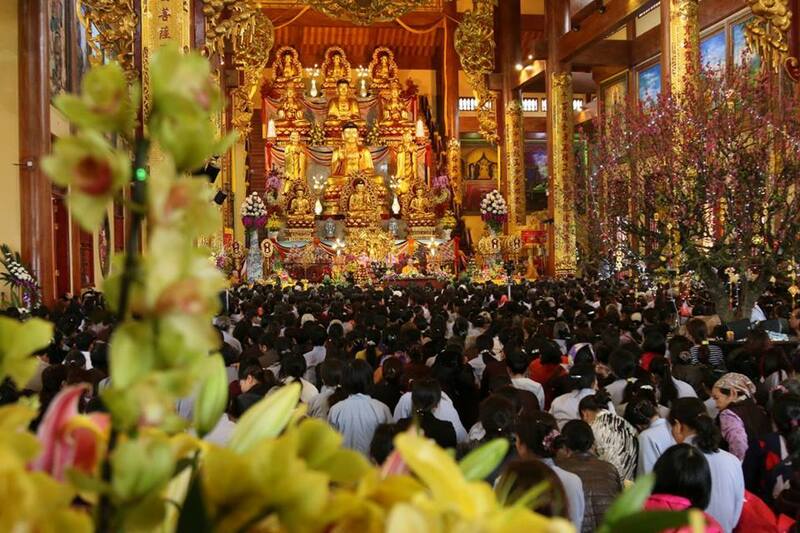 Ba Vang temple is in Quang Trung ward, Uong Bi district, Quang Ninh province. It is far from Hanoi center about 135 kilometers, far from Hai Phong city about 35 kilometers and far from Halong city about 45 kilometers. Ba Vang temple is a new temple. It was finished building in March 9th, 2014. Although Ba Vang is a new temple, it recalls the ancient in our mind. The color of mountains, the color of the tile roofs and sparkling shapes in night make everything pensively, you will feel as if you lose into a magical realm. From Halong, the cheapest way for you to move to Ba Vang temple is getting the bus No.08. Getting the buses to move in Quang Ninh is convenient for you with cheap price and buses are available every 20 minutes per turn from 05:00 to 19:00 everyday from Dong Trieu district to Ha Phong ward in Halong city. This bus has the route from Dong Trieu bus station- Uong Bi city center- National road No.18A- Bai Chay bridge- Halong city- Ha Tu (in Ha Phong ward) and way back follow the opposite direction. You can get the bus No.08 in Halong to get Ba Vang. With the distance from Halong to Ba Vang, it just takes you 10,000vnd per turn. It is so cheap! You can feel free when travelling to Ba Vang temple from Halong by bus. 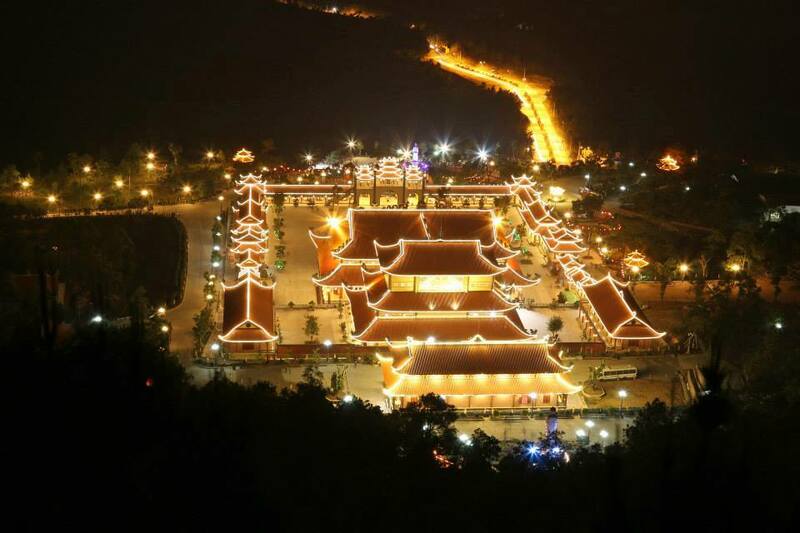 Ba Vang temple is located on Thanh Dang Mountain. Bao Quang Tu (Bao Quang temple) is the other name of Ba Vang temple. 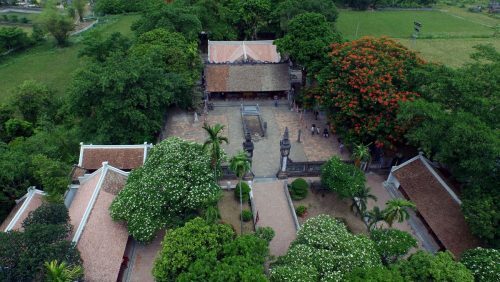 Ba Vang temple is the folk name of Bao Quang temple. Ba Vang temple is located at a height of 340 meters compared to sea level. It is in the West of Uong Bi city. Bach Dang River is winding in front of Ba Vang temple, it looks so nice. Far away Ba Vang temple is Hai phong city, Do Son beach with multiple layers of lapping waves. Thanh Long Mountain is on the left of Ba Vang temple. Bach Ho Mountain is on the right of Ba Vang temple. We can say that Ba Vang temple is situated in a beautiful location. From Ba Vang, you can see the beach and mountain with fresh air and great view. 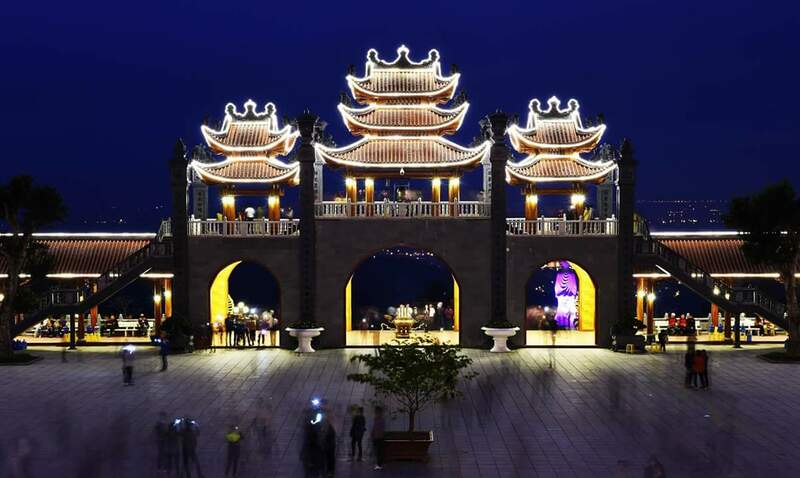 Don’t hesitate to spend just one day to admire this beautiful temple in your trip. Firstly, you need to pay attention to your costume when you visiting Ba Vang temple in particularly and other temples in generally. You should not wear skirt, should not wear indecent clothes when entering the temples. Secondly, you should wear sneakers or low-heeled sandals in order to be convenient when you move in mountainous terrain. The next one, you should not buy any unknown-origin-product, should not believe in superstition in tourist areas. You should to ask the price of goods clearly before giving a decision to buy them. Lastly, don’t forget to bring some changes when you visit Ba Vang temple or other temples. With the changes that you bring, you can worship Buddha in temples; you can also put money into donation box. You should not put money into statues, wells as many people do, it will affect badly to temples and scenic in tourist area, affect badly to our living environment. 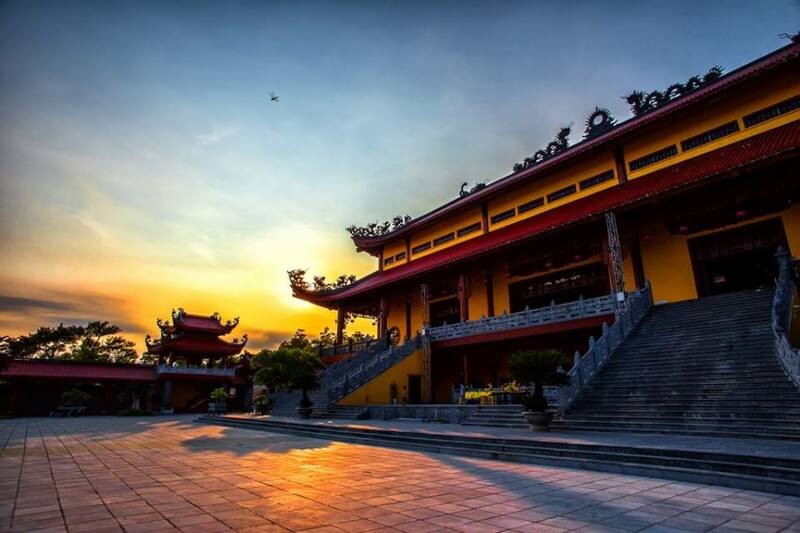 Ba Vang temple has just been finished in 2014; however, it is one of the most attractive temples in the North of Vietnam because of its beauty. If you have ever traveled to Halong, don’t hesitate to get the bus to Ba Vang temple, admire its sacred beauty but not least the sparkling and modern.